As you slowly meander up the Whiteface Veterans Memorial Highway, you start to wonder about the plants around you. They’re so different and sparse up here on the high-elevation rocks. How do they survive? What makes them different from plants in the valleys? Are there animals that live up here? How do they do it? It’s sure nice here in the summer, but what’s it like in the winter? 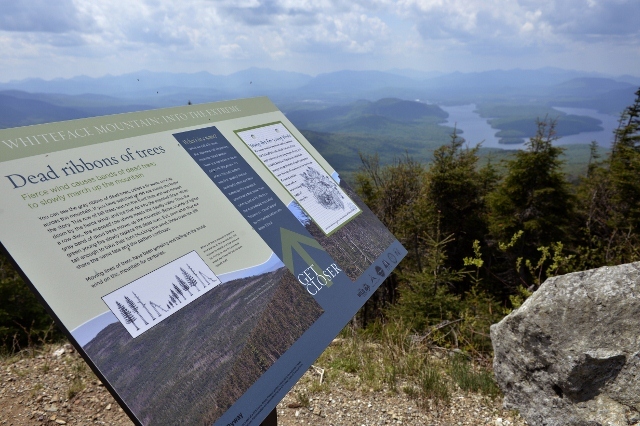 It turns out you’re in luck: There are a whole series of exhibit signs that answer these questions and many more as you hike, drive, or cycle to the top of the fifth-highest peak in New York. The Wild Center, a natural history museum based in nearby Tupper Lake, installed the exhibit in 2013 with help from a variety of local organizations. It’s the highest museum exhibit in the state, reaching 4,867 feet in the air at the peak of Whiteface. The idea is to catch people where they’re experiencing nature — and where they might have questions about it — and tell them a story about it. There are signs at some of the pull-offs along the 5-mile toll road on the way up the mountain, at the castle near the top, and around the observation tower at the top of the mountain. It’s not just on the mountain, though; there are also interpretive signs at the Whiteface Visitors Bureau in Wilmington, and on the bridge heading in to the ski center as well. Because they knew that Whiteface is a harsh environment, the exhibit’s creators paid close attention to making the exhibit elements extra durable so they’ll last for many years despite the wind, cold, and snow. They’re made out of phenolic resin, an extremely durable material, and printed with a process that is both high quality and highly durable. The exhibit deals with a wide variety of subject matter including how the mountain was formed, things you can see from the peak (sometimes you can see Montreal on a super clear day! ), and the effects the brutal conditions have on the mountain and its flora and fauna. Whiteface is the tallest mountain in New York that’s accessible to people with handicaps. The toll road allows vehicles to drive up to close to the top, then there’s a 426-foot-long tunnel dug into the middle of the mountain, and an elevator that carries passengers from there 276 feet up to the Round House and weather station at the tippy top of the peak. It had to be handicap accessible, because it was originally dedicated by the wheelchair-bound Gov. Franklin D. Roosevelt in 1929, then Roosevelt returned as president in 1936 for the highway’s opening. The scenic drive up the mountain is absolutely gorgeous with many, many breathtaking views, and it’s popular for people on both cars and motorcycles. And it’s a popular uphill cycle for those who are into that kind of thing (ie. not me). There’s also a hiking path from the castle to the top of the mountain, and there are various other places hikers can get on the path along the way up, too. The exhibit is open to the public, though various parts include a cost of admission: Tickets are required on the Whiteface Veterans Memorial Highway, a five-mile ascent to the peak, and a fee is charged for gondola rides. The highway is open from 8:45 a.m. to 5:30 p.m. daily from June 17 to October 10. Until June 13, it’s only open Friday to Monday. The Wild Center also keeps a page on its website where the curious can learn more about the harsh environment of Whiteface https://wildcenter.org/dig-in/island-in-the-sky . You can head there to learn about conserving habitat for the Bicknell’s thrush, a bird that only lives in high-elevation Alpine environments like Whiteface, where the mountain got its name, and see videos comparing native animals to Olympic athletes. You can also see a live video stream from the top of Whiteface Mountain or see all of Whiteface from the shore of Lake Placid.